Brioche knitting creates a cushy, reversible ribbed fabric that comes about by working one stitch and slipping the next. 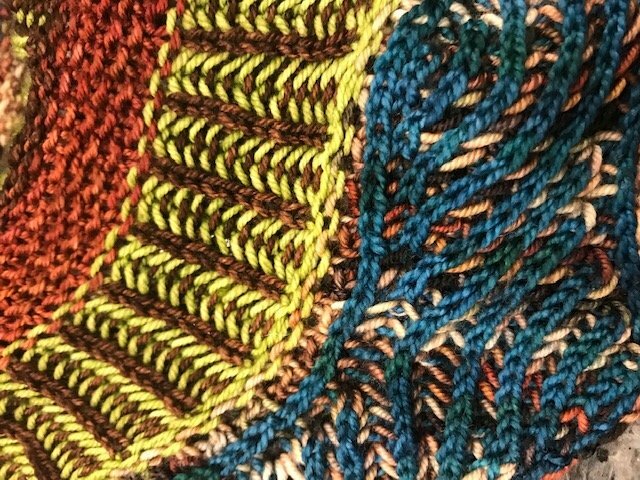 In 2 color Brioche Knitting, two rows are worked for each counted row. Come join in, and learn how to create beautiful garments for this seasons hottest look! Materials: Two worsted weight yarns in smooth, light or bright highly contrasting colors; Size 8-9 circular needles; Standard Notions Bag. The BEBEB Scarf pattern by Nancy Marchant is free and can be found on Ravelry. Please print yourself a copy in colour at home and bring it to class. Requirements: Materials to bring: Two worsted weight yarns in smooth, light or bright highly contrasting colors; Size 8-9 circular needles; Standard Notions Bag.